Accra, Jan. 28, GNA - Real Tamale United (RTU) has been asked to replace Kumasi Asante Kotoko in the ongoing 4th edition of the GHALCA Top Four Tournament following the latter's withdrawal from the lucrative competition. The offer has been accepted by RTU, who according to our information have stepped up their preparations to join the three other clubs in the tournament. RTU, the "Pride of the North" became the automatic replacement for the Confederation Cup losers for placing third in Zone A of the GT Premier league last season. Information gathered by the GNA Sports from the secretariat of GHALCA indicates that the association has corresponded its decision to the Tamale club who have welcomed the news. With this development, RTU will on Sunday take on defending champions, King Faisal at the Kumasi Sports Stadium in the second round match of the competition. GHALCA, organisers of the competition have therefore waived the three points and three goals awarded Kpando Heart of Lions after Kotoko had walked out of the game in the first match at the Ohene Djan Sports Stadium in Accra last Sunday. The Association has therefore declared the match between Lions and RTU as an outstanding match, which will be played at a yet to be announced date. 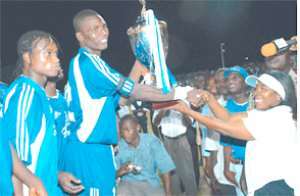 RTU, winners of the novelty edition of the Special GHALCA Knock-out competition, exhibited an impressive performance in the 2004 Zonal league, which saw them in a close contention with Faisal for the second spot position. The Northern-based team will now be entitled to the 250 million cedis appearance fee as well as other entitlements due Kotoko, the original participants. Kotoko who are yet to recover from the hangover following the defeat suffered at the hands of Accra Hearts of Oak in the finals of the Confederation Cup Competition, last Sunday saw their players backed by some officials walking off the pitch in protest against a penalty awarded against them by referee Joseph Lamptey in the first match of the competition against Heart of Lions. The unfortunate action of the two time losing finalists of continental trophies attracted the fury of GHALCA, leading to their declaration as losers of the said match. The walk-out, now known in football circles as "yembo biom" meaning we would not play again, also resulted in the ripping of the plastic chairs at the May 9 Stand of the stadium by irate fans of Kotoko in protest against the referee's penalty decision. Known for its large following, the withdrawal of the Kumasi club is likely to affect the attendance at the stadium during the competition.